Hotter than hot – "Sizzling Hot™ deluxe"! This 5-line (fixed), 5-reel video game will inflame your spirits. 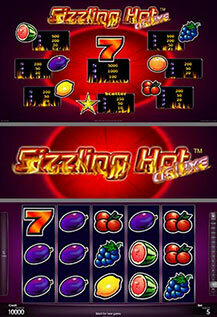 It is the deluxe version of the highly popular international bestseller "Sizzling Hot™" – a true video gaming classic. Have fun with this enthralling hot fruit game!